The Edit Genetics panel is the place to store the genetic characteristics of a person such as their blood group (ABO and Rhesus (Rh) blood group system), hair colour and eye colour (left and right eyes can be defined separately). You can store other genetic information as a note. Fig 1. The Edit Genetics panel. You can record results from Y-chromosome DNA, mitochondrial DNA, and autosomal DNA tests. To add a DNA test result, right click the DNA test results list box and choose the type of DNA test result you want to record. Fig 2. Adding a DNA test result. Selecting a DNA test result from the list of test results loads it for editing. In most cases, you would simply store the main conclusion from a DNA test (such as the haplogroup the of the person tested). 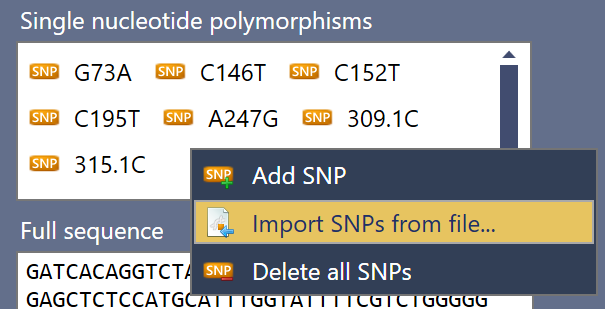 You can also import and store the raw data in the form of single nucleotide polymorphisms (SNPs), short tandem repeats (STRs), or full sequence data. Fig 3. Editing a DNA test result. SNPs and STRs can be imported from a comma separated value list stored in a text or comma separated value file. They can also be imported copying the data from the clipboard. Fig 4. Importing STR or SNP data. There is no unified format for raw DNA data but data from most genealogy DNA testing companies can be imported directly from their raw data downloads. If the raw data doesn't match a known format, it will need to be formatted into a comma separated value file. See the table below for samples of how to format the data for the different kinds of DNA tests.